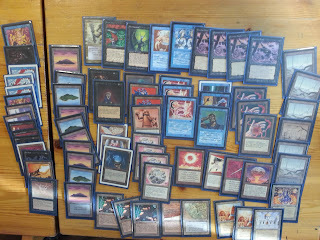 I'm continuing with posts of n00bcon decklist for now, still lot of sweet tech to be shown. The Distress archetype was (as far as I know, and at the very least in our community) invented by Daniel "GaJol" Nilsson; the highest ranking non-shark in the last year's pwp standings. I've previously written about Nilsson and his great contributions to both the meta and the spirit of the format, so for now we'll just dive in to the tech. Distress was originally based on the assumption that no player can destroy more than 4 enchantments (as they only play at most 4 Disenchant). Hence, if a player can maintain control enough to not lose the game himself, it will be very hard for the opponent to handle multiple clocks in the likes of Underworld Dreams and Warp Artifact. The name is based on the "bleeding" feeling of the opponent, and primarily as an opposite of the word tranquillity (as the card Tranquillity destroys all enchantments). 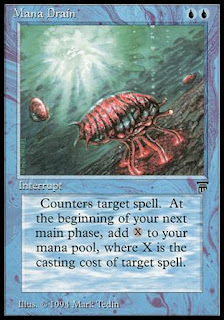 I don't really remember when or how, but many years ago I read about a deck that was noted to have "playsets of both Juzam and Birds" ("birds" not "bop", as in the mid 90's people hadn't invented abbreviations yet; wog was still referred to as wrath and no one called wheel of fortune "wof" or something like that). As I recall, the deck was called Machine Head, a name that now implies a red-black deck, but back then created images of Terminator Juzam in my head. Frequent readers of this blog may be familiar with the antics of Viktor "Oldschool" Peterson. He won n00bcon 2010 with a deck that used Millstone and All Hallow's Eve to reanimate Colossus of Sardia, went on to build the Land of the Lich deck, and most recently top8'd BSK with a deck that abused Field of Dreams. This n00bcon he was one duel from getting to the top8, again with some impreesive secret tech. The only thing he had said about the deck before going in to the tournament was that it could create a lock harder than Stasis, and that it used multiple copies of Fastbond. The deck uses Living Plane and Drop of Honey to kill all the opponents lands, and also make him unable to play any new lands (as they have summoning sickness, and will be destroyed before they can be tapped for mana). In addition, the deck supports Energy Flux to destroy all potential artifact mana. After it has achieved control, the deck can win using it's own lands to attack the opponent. After n00bcon each year, a group of players and organizers take a hard look on the B&R list and see if we need to change it. Updates are based on what we hear from players, the last year's results and previous year's discussions. Many cards were discussed, here are five of them. 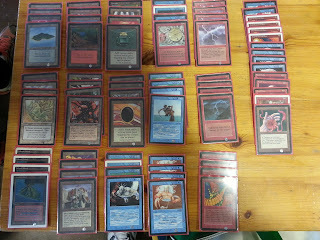 Mind Twist: Mind Twist is insanely good, feels unfair, and have a history of being banned in Vintage. This year again we talked about it's impact on the format. Even though it can be a backbreaking card to face, we think that we should never ban non-ante cards from tournaments. Mind Twist is still restricted, and it seems highly unlikely that it will ever be banned. 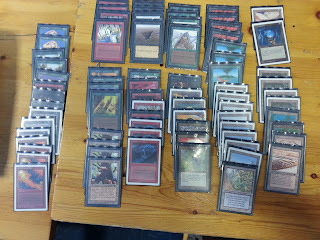 Daniel "Kungen" Ahlberg managed to take photos of at least 22 of the decks played at n00bcon, so rather than posting decklists, I have the opportunity to post photos for many of the lists played. We'll start with Robin "Hagelpump's" red/blue creation. Robin has been a mainstay at n00bcon since the start. This tournament he allied himself with Jocke Almelund to form Team PropellerCap; with Jocke finishing at a second place after beating Robin in the semifinals (I also remember a third man with a cap that said "The boss" or something similar, I guess that could have been the team captain). Before that, Robin defeated yours truly in the final game of our top8 match by playing an alpha Shivan Dragon, which is a fairly satisfying way to lose a match. 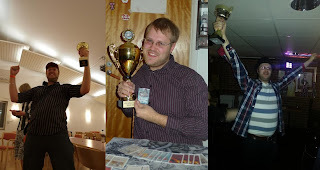 Rumor says that when someone asked what it was like to play Legacy in Sweden, the answer was "Legacy is a format where you play for 50 minutes, then Elof the Mighty wins". 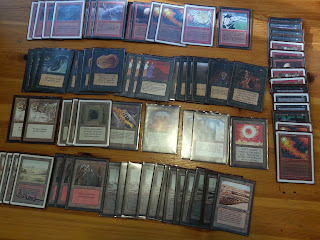 Elof's run in 93/94 magic looks like an equally overwhelming dominance right now. During both n00bcon and Warcon, he didn't lose a single match. To top of his last years achievements he also won BSK, making him the single player to win all the Sharks last year. Considering the fact that no one else has more than a single Shark (though in all fairness; Pefken has won n00bcon twice), this is highly unprecedented. Winning is usually not the top focus for many players in these tournaments, but when someone runs this good, it's hard to not be impressed. An great weekend with good friends has passed. We saw lots of new tech, a stacked top8, and sweet magic. Thanks to everyone involved in making the tournament, and thanks to everyone who came to play!